3) Can do anything from illustrating a nursery rhyme to a full adaption of a picture book or a full-scale play. 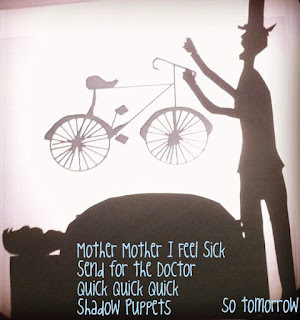 One of the greatest picture books of all time is Mother, Mother, I Feel Sick Send for the Doctor Quick, Quick, Quick by Remy Charlip, who actually suggests trying it out as a shadow puppet show. I decided to take him up on that idea and MMIFSSFTDQQQ will be the main attraction at our Shadow Puppet Theater Program over the school break. (I'll post another time about the other, shorter stories we performed). I'm submitting this for Flannel Friday because it would be possible to do this story at storytime (even without a helper), so I think it counts. First I want to say that I had SO. MUCH. FUN. making this show but that basically everything that could have possibly gone wrong* in preparing it did. Murphy's Law totally applies to children's librarians. One way to perform this story would be to take a child volunteer from the audience and have him/her play the main character. All he/she needs to do is lay down and you would play the doctor and pull miscellaneous items out of his stomach as if he had swallowed them as in the book. You would both be hidden behind a large white sheet and the audience would see you in shadow. You could use whatever junk (official library term: realia) you have around. Very little is referenced directly in the text and you can make up your own bits to stretch it out. 1) I drew all the pieces in Microsoft Paint using this method I posted about previously. It took me a few hours of desk time, but I think they turned out great! I made the doctor's hat a separate piece from his body so it could disappear at the appropriate time. I also cut the doctor's body in half so he could bend to pull items out of the boy. Likewise, the boy's stomach is made separately so it can shrink as items exit. 2) I opened them all in Microsoft Publisher and used the image re-sizing tool to get the pieces exactly the right sizes. 3) Then I printed the images of the doctor and the boy onto black card stock using our ink-jet printer. 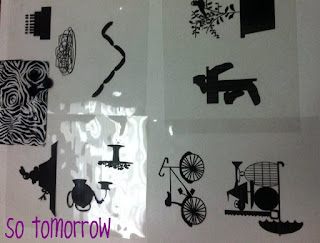 Even though the images are all black and the paper was black there was enough difference in the blacks that I was able to see well enough to cut them out. The people have to be opaque, so the other pieces will be surprise when "the doctor" pulls them out of his young patient. 5) Cut the pieces out. In my opinion, it looks better if you do not trim them, as the edges will be visible. Use tape to attach plastic straws to cutouts and the movable parts of people. 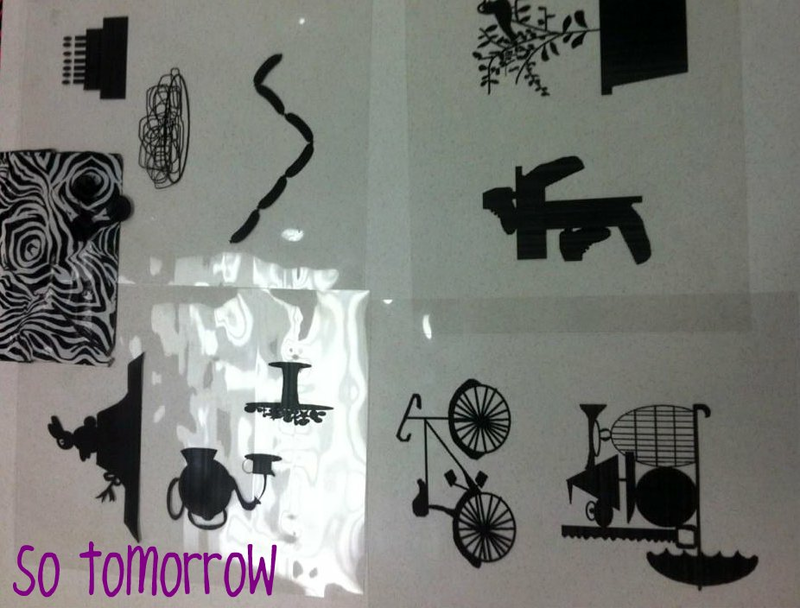 *I knew we had transparency sheets and black stock but couldn't find either, found them both and printed the transparency in an ink-jet printer--all the ink rubbed off, originally made some of the pieces too large to fit on the projector, and when everything was finally made correctly and I turned the overhead projector on to test it, the bulb burnt out immediately. amazing. i've been wanting to make this shadow puppet show for awhile, and it always helps to see how others would make it. thanks for posting!